We found this lovely poem in our Donegal Shop Archives today, and it reminded us of the intricacies of handweaving, an art we have supported in our products for 20 years now. Donegal is reknowned for it’s hand weaving and looming and we have the likes of Studio Donegal, Rossan Knitwear and Carnaween Clothing products in store to show the amazing craftsmanship on offer from Donegal today. We wanted to showcase McKernan scarves this week. 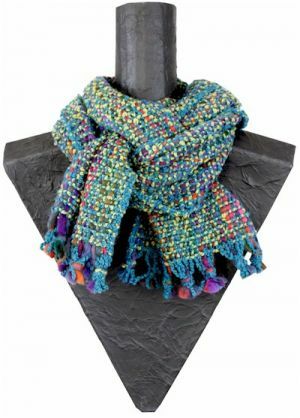 Remarkably Eugene and Anke McKernan make beautiful scarves on a 19th Century Hattersley Loom. Shown here is our favourite Bubble scarf. This 19th century technology creates a woven selvedge on every scarf, a feature reminiscent of handwoven textiles. 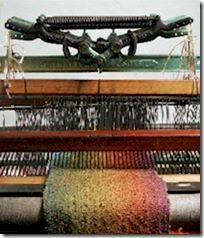 The knitted styles are made on their 50 year old mechanical as well as a modern multi-gauge Stoll knitting machine. Each scarf is then hand finished in the McKernan workshop. As a family business using traditional production methods Eugene and Anke McKernan have stayed true to their core values of sustainable quality and imaginative design. With good craftsmanship, original patterns and a multitude of natural textures and harmonious colours they fabricate scarves which consciously differ from fast changing fashion trends and often become unique and treasured keepsakes. From one family business to another, it’s a pleasure to sell these scarves.